Joe Pye Weed showed up in the wilder parts of my garden a few years ago. I think it looks terrific with Angelica Gigas. Named after the American Indian , Joe Pye, who was said to have cured typhus with it. This is a fantastic Native American perennial herb. Every part of this plant has medicinal properties. It grows along the east coast in meadows and can reach a height of 12 ‘feet. In my garden it’s closer to 4’ feet in height. 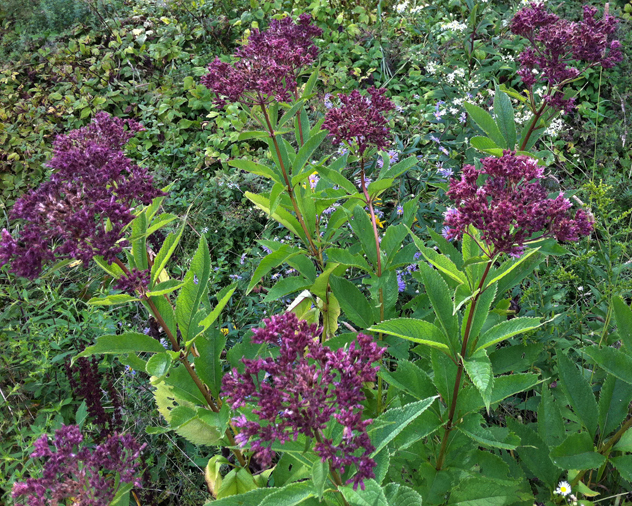 Gallery | This entry was posted in Perennials and tagged Eupatorium Purpureum, Joe Pye Weed, Perennial herb. Bookmark the permalink.